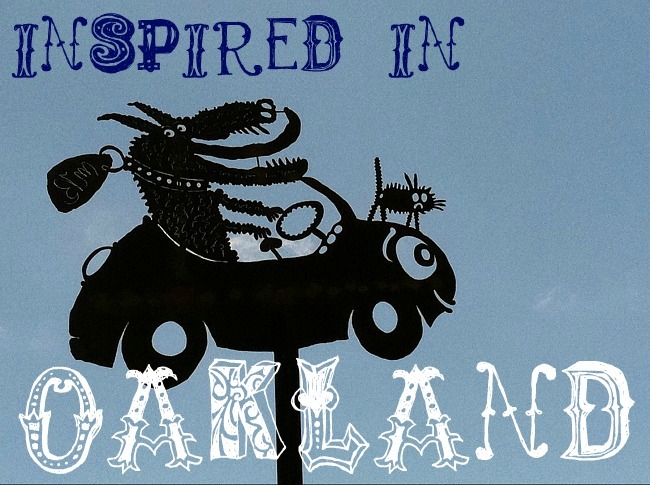 From artist and designer Erin of Elysian Studios, I discovered this great opportunity to creatively support families with children affected by rare diseases. 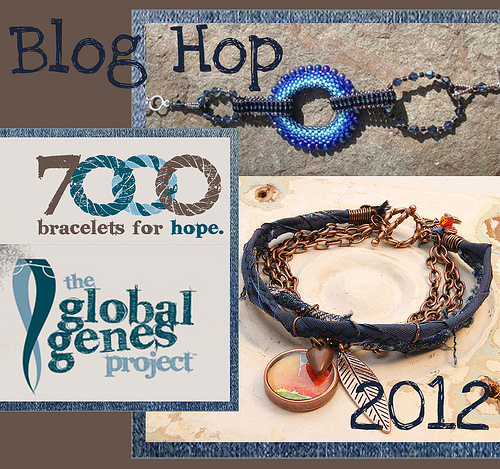 What is The Global Genes Project and what are 7000 Bracelets of Hope for? The Global Genes Project exists to raise awareness and support for the more than 30 million people affected by rare diseases. There are currently over 7,000 rare diseases identified, and 75% of those affected are children. With the 7000 Bracelets Campaign, the Children’s Rare Disease Network gives artists and crafters an opportunity to lovingly share their creative gifts with families who have a child suffering with a rare disease. The bright turquoise colored stones, pearls, and crystals feel good to wear; the special double-sided Thai silver charm and smoky quartz are symbols of strength and hope to me. Hop on over to the designers below to see more creations from the heart! Tara- I love both of these pieces! The first one is so lush with all of the colors and textures you chose, and the second is simple and lovely! Whoever receives these will feel so beautiful and special! Thank you very much for joining us on this hop! Mermaids are the best, yes? Spring upwelling inspires them to come closer… Thankyou!! xoxox! Wow! Those are both beauties! That top one especially spoke to me. They both have great color combos and a great vibe. Thanks so very much for participating!!! WOW 🙂 Both gorgeous. 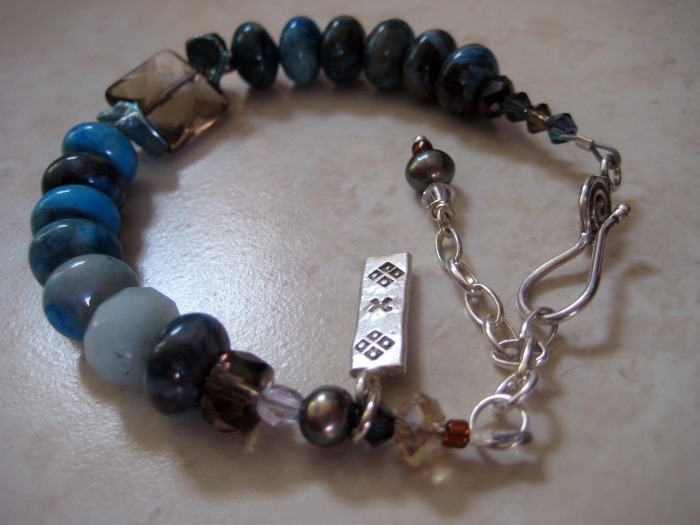 I really love the second one, I am in love with the blue-grey bead and the little charm. Thank you Pink. I enjoyed your work as well- great designs. Those are gorgeous bracelets. The ladies receiving these are going to be so happy. Both of the braclets are so pretty….and I love using chain to make them adjustable! The multi-strand bracelet is my favorite! I think both of those bracelets are wonderful and will be greatly appreciated by whomever receives them. I’m personally partial to the second one. The beads in it are really fabulous. Doesn’t it warm the heart to do something like this? I love that a whole community can come together like this for a cause! Yes CH: it is all heart warming. It’s hard to stop actually, everyone’s work was so inspiring! I’m getting ready to make another using one of your art beads…Thanks for stopping by Skye! Beautiful colors, gorgeous stones … I really like them both so much. p.s. I’m also having some trouble leaving comments at some, but we’re trying, right?! Tara Linda! The symbolism of the Thai charm and quartz is perfect! Both bracelets are beautiful! As for Blogger, I know a lot of people are having problems commenting so it’s probably another glitch with their hosting. Both of your bracelets are gorgeous, but I just drooled when I saw the second one. Something about it just spoke to me. I hope it will do the same for the recipient. Glad we could all contribute to such a great cause. You made my day Shirley; thank you! 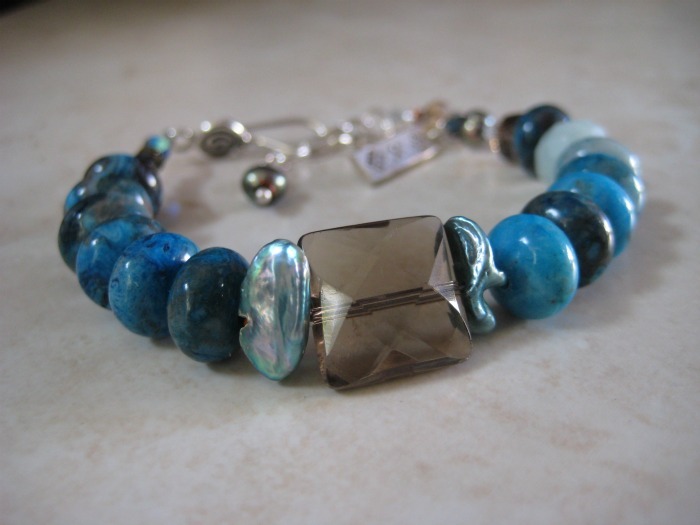 Love the blue beads from both bracelets! The 2nd one really has the denim look going for it! The first is full of cheer, the joyful color of turquoise and shells–can’t go wrong with that! They are both really wonderful! Great bracelets the colors are perfect. They both look so cheery and just the right touch of sparkle. 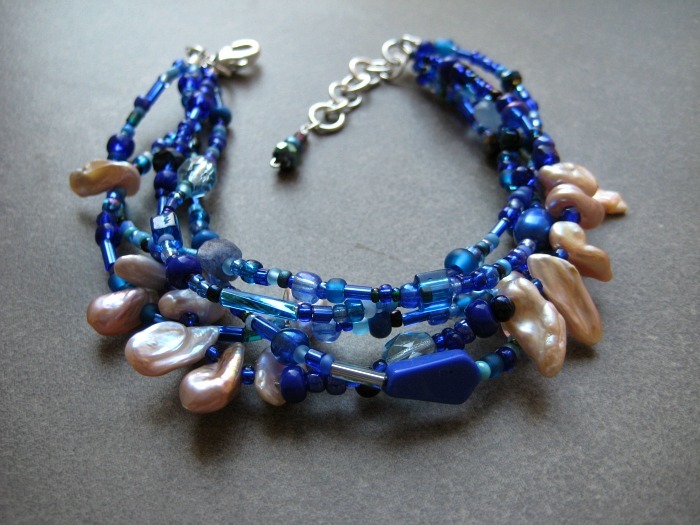 Love your mix of blues, pearls, and charms. Both will be worn by folks who will know they were made with love and support. Very Beautiful work Tara. Both of your bracelets are awesome and will bring great joy to the one who receives it. 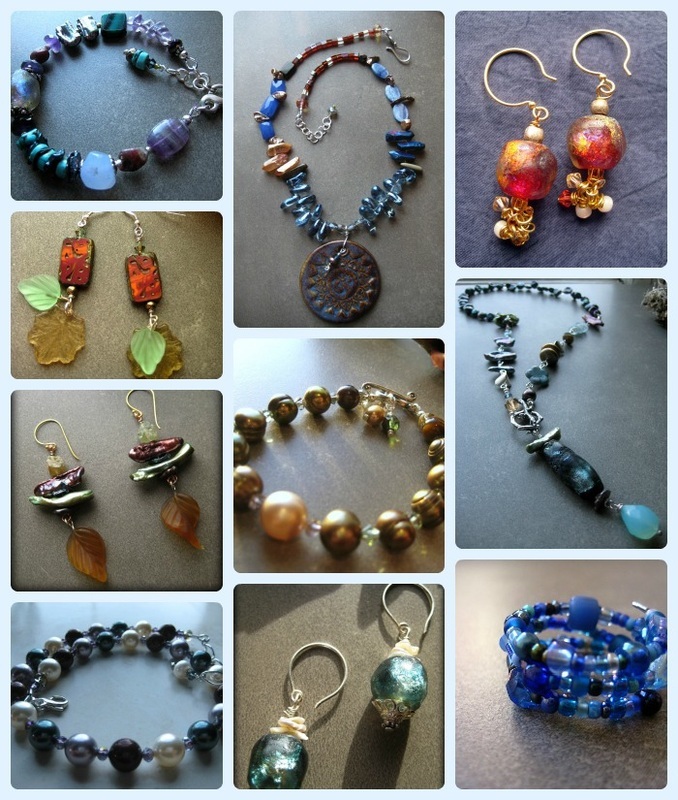 These are both so pretty – my favorite is the second one with the faceted square quartz bead – love that one! Whoever receives these will truly feel special -they’re beautiful! Tara, I have to admit that browns and blues are my fave combination to work with, and as such I just *love* both of your bracelets! They’re gorgeous, and whoever ends up with them is sure to love them too. Ooohh . . . Thai silver! It’s been awhile since I’ve seen any of that. That charm is a special touch. I love the brown and blue combo, too–one of my favorites! 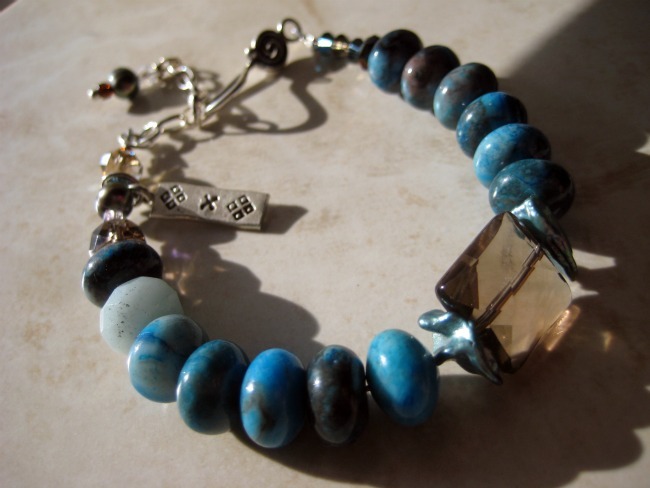 You have a wonderful way with blues – both bracelets are beautifully designed and crafted! I clicked over to your gallery and got lost among all the beautiful pieces! My apologies for the delay, but was traveling overseas for the past few weeks. I love them both! Very pretty designs and colors!